Does Your Dog Get the Zoomies? Has your dog ever started running around like a maniac for no apparent reason? Some dogs get sudden bursts of energy that seem to make them go from 0 to 60 in mere seconds. Many people call this "the zoomies" because it often causes the dog to zoom all over the place at high speed. What Causes Dogs to Get the Zoomies? The term "zoomies" is used to explain the sudden bursts of energy many dogs seems to get at random. More technically, these episodes are called Frenetic Random Activity Periods, or FRAPs. 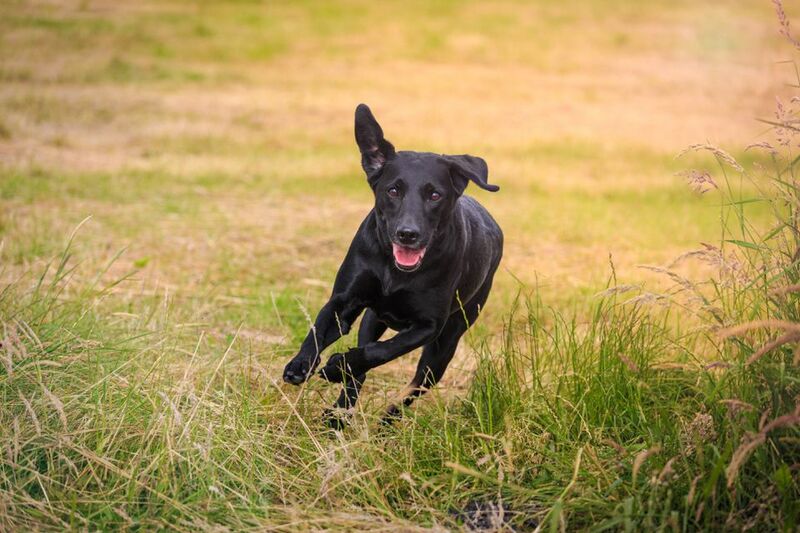 When dogs get the zoomies, they are typically releasing pent-up energy and relieving stress. Most dogs will experience these energy bursts occasionally, even if they are getting enough exercise and activity. However, frequent episodes might mean your dog is bored and not getting enough exercise and/or mental stimulation. For many dogs, FRAPs involve fast, intense running and playing. Some dogs will chase their tails or run in circles. Sometimes, these episodes seem to come out of nowhere. Other times, an episode is brought on by excitement. Your dog may see someone he knows or find a beloved toy, then suddenly get the zoomies. It is very common for the zoomies to be somewhat contagious. Seeing a dog "frapping" can set off the zoomies in another dog as well. It can be a lot of fun to watch dogs enjoying themselves during these bursts of energy. Perhaps the most fascinating aspect of FRAPs is that the dogs seem to be completely occupied when they are happening. Many dogs seem incapable of hearing their owners and following cues, no matter how well-trained they are. The zoomies seem to put dogs in their own little worlds. FRAPs typically last for several minutes before your dog becomes rather exhausted. Many dogs will lie down, panting and utterly spent. At this time, it can still be pretty difficult to get your dog's attention. Most dogs need several minutes to relax before they are willing to go anywhere or do anything you ask of them. In general, your dog's episodes of the zoomies are nothing to worry about. Just make sure that your dog is in a safe place when this happens. Ideally, the zoomies will occur outdoors in a fenced-in area. Make sure you always keep your dog on a leash and never allow him to roam free. This will keep him from suddenly running wild through the neighborhood, wreaking havoc and risking an accident or injury. If your dog gets the zoomies indoors, you might want to move anything fragile out of the way. Fortunately, most dogs are able to navigate with some grace even when frapping, but accidents happen. Try to lure your dog to a carpeted area to avoid slipping and sliding. Also, try to keep your dog away from any stairs. If two or more dogs have the zoomies and are playing, be sure to watch carefully so the playing does not become too intense. When excitement levels are high, playing can quickly turn to fighting, even in dogs that usually get along. If the dogs do start fighting, be extremely careful trying to break up the fight. If your dog somehow manages to get loose during an episode and you are not in a fenced-in area, you will need to carefully catch him. First, try the recall command. If that doesn't work, use an emergency recall (if you don't have one, you should work on this). Don't chase your dog as this will just seem like a game to him and will likely make him run away faster. Instead, make a different type of game out of it and try to get your dog to chase you. See if you can lure him to a fenced-in area or indoors. Then, keep playing for a little bit so it doesn't seem like a punishment. Once your dog settles down, offer treats and praise. One risk from the zoomies is present during warm weather. Your dog can easily overheat when running around maniacally during warmer months. Be sure to keep plenty of fresh water available at all times. Watch your dog for signs of heat exhaustion or heat stroke. Try to distract your dog and calm him down if he appears at all overheated. Overall, the zoomies are a normal part of being a dog. As long as your dog is in a safe situation during the episode, sit back and enjoy. It can be pretty funny and entertaining to watch this behavior in dogs!